It’s reasonable to seek out valuable life advice from a self-help book, life coach, or even your best friend. Your family may also be a crucial source of help when you need some life guidance. Heck, you could even turn to a newspaper advice column for insight on how to brush up your life. We’ll be honest: you probably wouldn’t turn to a restaurant’s blog for some interesting (and biased) life pointers. Yet, here you are reading this, so Lakeside Anchor Inn only thought that it was appropriate to share our appreciation for life and living in the moment with our blog readers. We say that our life pointers are somewhat “biased” because we’re all about enjoying life to the fullest and that’s the message that we want to gently push onto readers like you. But isn’t having fun and enjoying life a message that everyone can get behind? We think so, at least! Be Someone That’s Pleasant To Be Around. Smile! You certainly shouldn’t live your life trying to please other people or morph your personality into something that you’re not comfortable with. By all means, be yourself, but don’t dwell on the hard times and focus on the negatives. These stressors will seep into your personality, and will generally make you an unpleasant person to be around. Smile at others, laugh at their jokes, and crack jokes of your own. We guarantee that everyone will have a better time with this jubilant spirit in mind! Realize That Everyone Knows Very Little About…Everything. Or Do They? You could spend your whole life studying the purpose of our existence, the greater meaning of everything, our place in the universe, and so forth. But how can anyone know any of these truths for certain? At the expense of coming across as overly philosophical here, our recommendation is to accept that we’re all here for a very limited time, and you may as well make the most of it. Having Fun Is Good For Your Health. So Do It! Over the years, science has shown that laughter is quite beneficial for our mental health (and even our physical health — it’s an ab workout!). Taking a break and letting go of your worries, if even for a couple of hours, is something that everyone should do on a daily basis. We’re not telling you to put off your responsibilities indefinitely, but they’ll still be there for you to tackle tomorrow. Don’t dwell on them, and enjoy the day as it is. 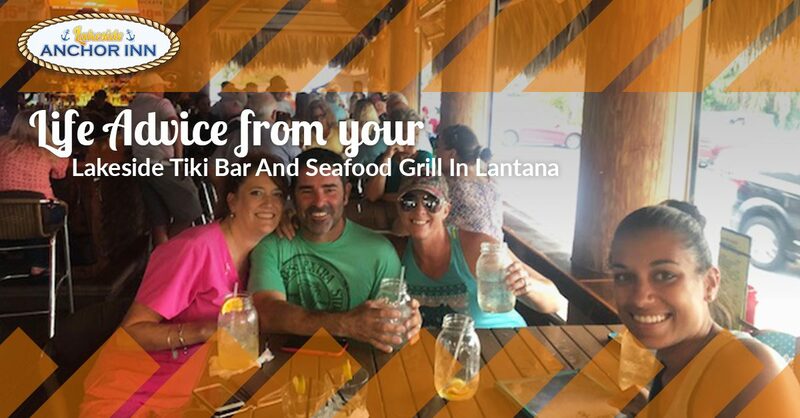 Have A Drink And Grab A Bite At Our Lakeside Tiki Bar Near West Palm Beach! We’re ready to enjoy this moment with you. Are you? Stop by Lakeside Anchor Inn today for a great time! Read More Insight From A Seafood Joint Here!